This time we meet Natasha. Let’s read what she write to introduce herself. Natasha Nicolazzi, born in Upper–Valais (Swiss German part, where we have the oldest roots of spoken German, named nowadays commonly a dialect) on May 30th, 1964 in a place called Visp from an Italian father and mother from the French speaking part of Switzerland.. Moved to the French part since at the age of 23. 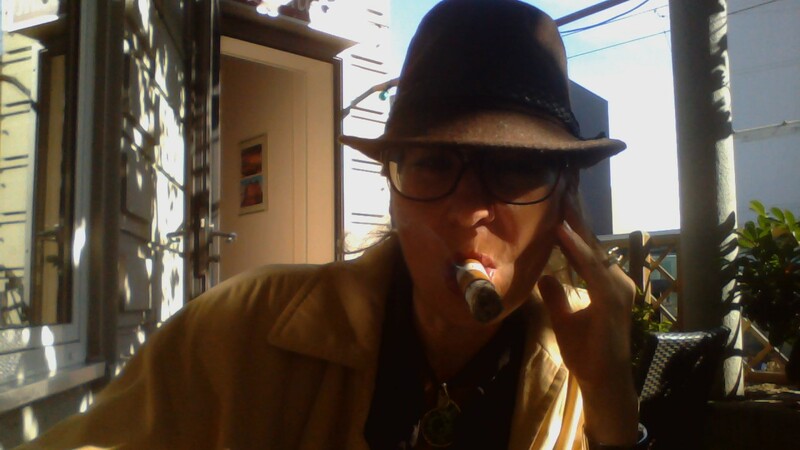 After nine years working for a bank and 18 years in the business of import/export, technical documentation and translation, I decided to start my own business in special and luxury events as well luxury take care, and the cigar. Next to this, I am creating my charity fund for young entrepreneurs and artists as to promote them. I hope, that this concept is going to grow over the Swiss frontiers. 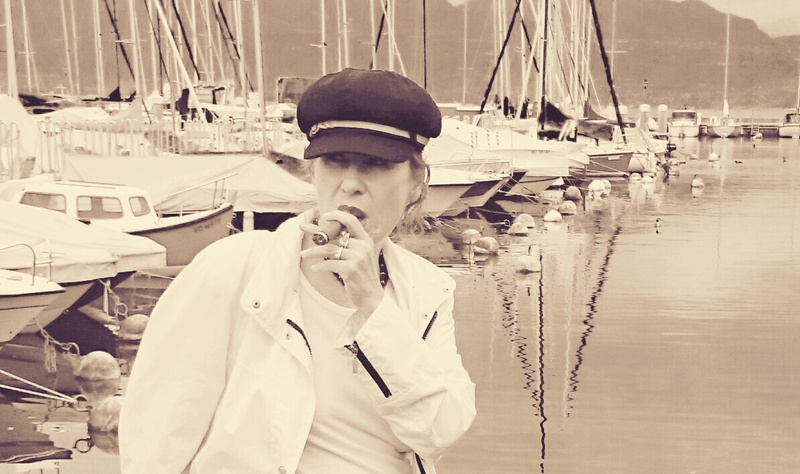 I love smoking a pipe on a Rockin’ Chair, sailing having a good cigar and a nice whisky, rum or cognac, love delicacies and good wines. All kind of water sports and sipping a nice cocktail on the beach, re-making the world around a table or on a breastwork (boat rail), skiing and relaxing at the moment of after skiing. Reading a nice book while savouring a pleasant cigar and a drink. As I am self-employed I can afford to smoke whenever I feel. My job offers me the opportunity to enjoy this passion at any time with my other passions. What a luxury…. Ballooning is another passion and way facing the world..
Next to this I am the owner of a miniature Steam – Locomotive. About 80 kg heavy and a 120 cm long with its carriage of water reserve. It is an old Western Locomotive and runs on a 5 ¾ inchs railway and I drive it at the Swissvapeurparc in Bouveret a place at the lake of Geneva. Very attractive and awesome spot, where you can enjoy a cigar amongst trains and historical monuments in a scale of 1 to 8. www.swissvapeur.ch. Actually, my little locomotive is the emblem of the park. And when I turn up with her I have all the children who want to go for a ride with. And smoking a cigar while entering into the station that gobsmacks everyone. I have always been in contact with the world of cigar, since I was kid and love the smoothness of tobacco leafs, the smell of cigar as the smoke. I guess there is no more freedom of mind provoked as by the scent of a cigar. I had my first cigar at the age of 22 and gradually started to smoke more regularly. From 25 on I got used having at least 2 cigars a day unless time doesn’t allow me to do so. Love that, just falling in an oversized leather chair and hanging around with smokers, nice chimney fire and a rum. Especially in winter up in the mountains in a cosy lounge or chalet, after a pleasant skiing day. The best moment of all. This moment taking of all, ski dress, heavy boots, gloves and falling into a leather chair in a smooth ambiance, close to a fire, feeling the warmth heating up your body and relaxing with a cigar and a fine nectar is just the most awesome contrast to the sunny and white day, full of efforts and specially before having a shower and go for dinner. It procures me the same pleasure, while smoking close to the beach and hanging around in a cosy open space with sitting next to an open fire or on a sailing boat with candle light and a lover. Listening to the regular movement of the waves and just enjoying this moment of pure sensuality. Without the appropriate tool in my hands with my teeth ;-). Casually, use a double blade guillotine. Relaxed, dreamy and fully aware of everything. Having myself rocked by the scent and the taste and leaving my imagination a free flow. Best moment of creativity. Not even an extraordinary wine will leave this taste and smell floating in the air, in your nose and in your mouth as long as a cigar is able to. Pleasantly around 11 am. Depending on the circumstances, with a nice coffee or a nice wine. A moment of pure delight. The closest touch besides wine you can have to nature, the smoothness of the leaf, to earth to the scents and with yourself. 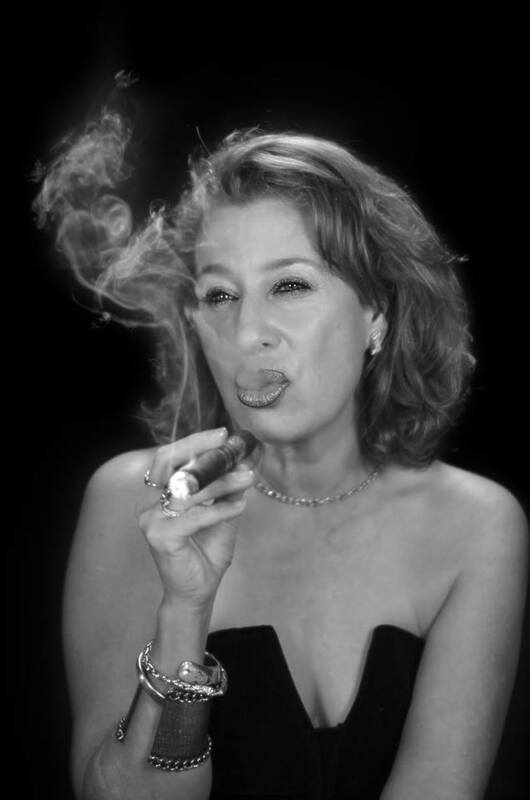 The touch of cigar: I think there is nothing more attractive and glamourous as a sophisticated, smart and handsome-wild elegance combined with knowledge of what it is all about. A lady smoking cigar and sipping suavely an old Armagnac is mind blowing and there is no description but just the deep feeling of having this charming capacity warming up a slight male chauvinist atmosphere. Thank you very much Natasha, it was a real pleasure read your words. Good ashes. 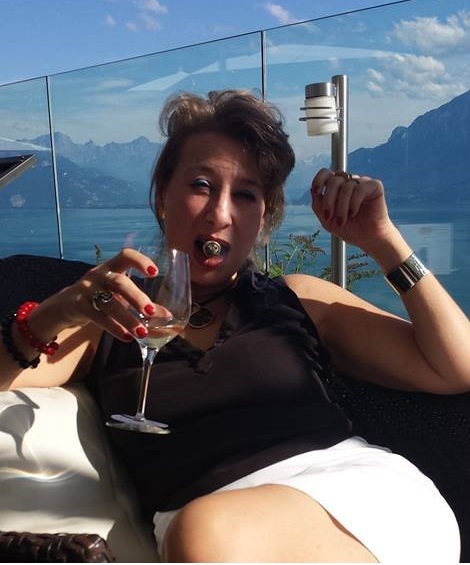 One Response to "“Natasha Nicolazzi„"
very nice sounds that you enjoy your cigars what’s your fav ?